Every child is unique and has their own learning style. However, some children learn differently than others or adapt to social experiences differently and may require additional support. Scholars with learning or developmental disabilities may learn at a different pace from their peers. To support scholars with disabilities, Compass Charter Schools (CCS) has a wonderful team of credentialed special education instructors who provide personalized learning experiences. The special education instructors partner with CCS’ educational facilitators to guide and support homeschooled children with disabilities. 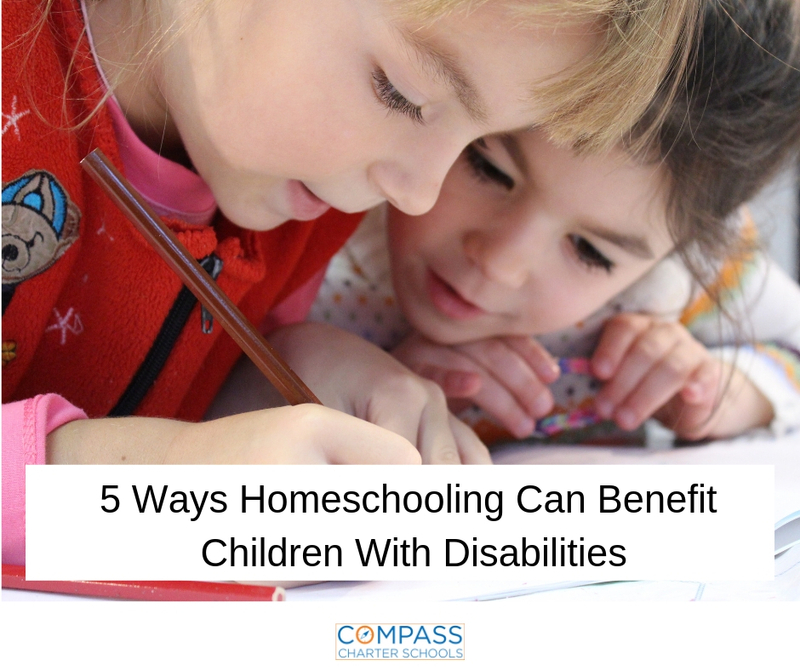 Homeschooling is a great option for scholars with special needs who may have difficulty in a traditional classroom setting. Homeschooling allows parents and teachers to identify a child’s unique needs and then create a personalized learning plan to help them succeed. Homeschooling allows parents to create a home classroom that is ideal for their scholar. They can keep distractions to a minimum by setting up a comfortable, quiet space for their scholar to ensure that they can focus on learning without distractions that are often found in a traditional classroom environment. Scholars with disabilities, and especially those who struggle with attention disorders, often need more frequent breaks throughout the school day. Many of CCS’ homeschooling families use modified daily schedules with additional break times for physical activity or short breaks that help scholars focus better while learning. Scholars with special needs often learn best when using alternative learning approaches. If parents notice that their scholar with a disability is struggling to learn multiplication tables, they can have their child try reciting math facts while doing jumping jacks. If their child has difficulty writing their spelling words, their scholar can try spelling each word out loud or even fingerspelling in the air. While homeschooling, parents can identify the learning strategies that work best for their scholar and implement them in a way that helps them succeed. Other alternative approaches to consider include math manipulatives, whiteboards, chalkboards, hands-on learning, and multi-sensory strategies. Scholars in a traditional school setting often have limitations on the time allotted for testing. Homeschooling allows scholars to take as much time as they need for tests so long as it’s part of their Individualized Learning Program (IEP) accommodation. Sometimes this added accommodation makes all the difference in the quality of a scholar’s work and results of their tests. Homeschooling allows scholars to use accommodations that help them learn or perform at their best. Scholars with handwriting challenges or dysgraphia can use a keyboard to complete their assignments. Other children who struggle with attention or distraction issues can use stress balls or other fidgets to help them pay attention or even walk around the room while discussing a topic. Scholars that have sensory challenges, which can be difficult in the traditional school environment, can perform exceptionally well at home with dim lighting, soft rugs, comfortable clothing, or even working in a bean bag chair.